YOUR CHOICE of three sterling silver inspiration message beads, 5mm sterling silver fluted beads and Bali silver dotted edge spacers. You choose your favorite accent bead, from sterling silver seamless, lapis. turquoise. onyx, Amethyst or Tiger's Eye beads. No further discounts on this laser engraved item. Shown with Lapis accent beads. 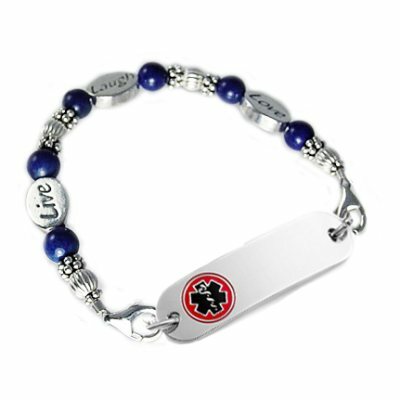 Price includes: One Petite stainless medical id tag with laser engraving and interchangeable beaded strand, two lobster clasps.. Faith, Dream, Survivor - Choose 3 & type in order desired below.